Doyle Finney has been a Supported Living resident since August 2007. He has become a valued member of the community, he is a member of the Leesburg Civitan Club where he has been the chaplain of the club for over 3 years. His commitment to the Civitan Club extends past Leesburg, Doyle attends the Civitan district meeting and conventions and was elected as the Sargent of Arms for the Florida district. 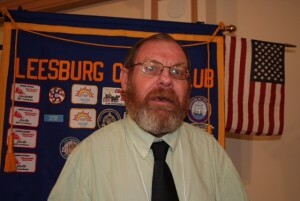 He is also an adviser for a new club: The Sunrise Civitan Club, which is based at The ARC Sunrise of Central Florida. He lives in a large home with an attached area that he loves to call his apartment. Doyle prepares and cooks all of his own meals; he loves to look up new recipes and share them with others. He cares for his pet cat and bird by himself and attends church with natural supports. On Sundays, Doyle has friends over and enjoys watching the NASCAR races on afternoons after church, with his guests. Doyle attends the day program at the ARC two days a week where he earns a modest paycheck. He saves the money he earns from his paycheck from the ARC to pay for and attend Civitan Club events. Doyle also participates in Special Olympics and enjoys multiple sports such as swimming, volleyball, softball and basketball. His volleyball skills even took him to the statewide Special Olympics volleyball competition. He was so excited as this was his first state event. Doyle is an easy going guy who loves to talk about sports, his community work with his Civitan Club, and enjoys the life style and freedoms he has living in Supported Living.